Just got finish samples from Oomph today. Aren’t they fun? As a designer, I try to make it to High Point Market at least once a year. Well, it’s like fashion week for the home. Furniture, accessory and lighting manufacturers from around the world converge in little High Point, North Carolina to show their wares. With over 11.5 million square feet of show space, over 2000 vendors and 75,000 attendees, the energy and excitement is palpable. As always, this Spring’s Market didn’t disappoint. I had such a great time connecting with fellow designers and vendors. I opened up a few new accounts with companies I think my clients will love! Oomph is fun little company with quirky occasional pieces that will add just the right finishing touches to your projects. Legacy Linens has absolutely gorgeous bedding and simple, yet elegant drapery panels with luxe custom details. Of course, I’m always "trend spotting" when I’m at Market, so I thought I’d share a few of my favorite trends. Thibaut is always one of my favorite showrooms – they’re always so colorful and well curated. I love the pattern play in this vignette. And that couch is super comfy! 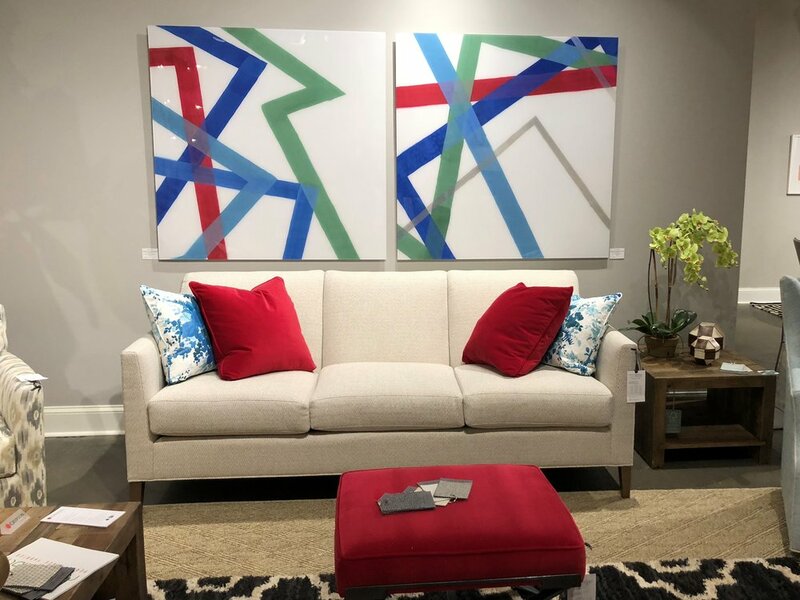 This CR Laine sofa with its striking, clean lines plays perfectly with the artwork. This is an easy way to bring a color out of your art and into your space by adding pillows and an ottoman. Placing color in different places in a room draws the eye around and makes a space look cohesive. Yes, that’s right! White sofas were everywhere at Market. And since they’re all sporting performance fabrics like Crypton and Sunbrella, they are very lifestyle friendly. Whether it’s kids and their sippy cups, pets and their paws, or your Friday night glass of wine, these fabrics are easy to clean and care for. And they’re not like the old performance fabrics that were stiff and scratchy. Now they have luxurious textures and beautiful patterns. To the left are two standouts from Thibaut and CR Laine. Another big trend at Market: brass! It started making a comeback a year or two ago and it is everywhere now, not just in lighting. I love the organic feel of this faux boix coffee table (Eicholtz, below, left) – a real statement piece. Who would have thought you could make a ceiling fan look good? This stunner would look equally good in a dining or family room (John Richards; below, center). This funky fuscia accent chair and fun little drink table could add just the right pop of color to perk up a dull corner (World's Away; below, right). Speaking of drink tables, there was no shortage of them at market. Lots of mixed media: glass and brass, wrought iron and lucite, marble and wood. All great little sculptural pieces and conversation starters. There were styles for just about any decor. Want to learn how to incorporate these unique statement pieces into your decor? I can help...just call!